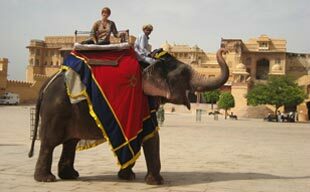 lies in Jaipur, the royal capital of Rajasthan where regal treatment overwhelms every tourist in the region. Culture and heritage has always been and will remain the biggest draw for tourism in India. Arrive Delhi and transfer to Hotel Overnight stay at the Hotel. Proceed for Agra. On arrival check into Hotel. Lunch at the Hotel. 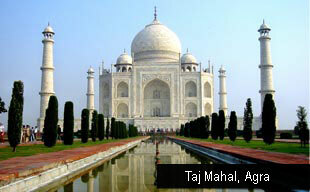 Visit Taj Mahal one of the Seven Wonders of the World and surely the most extravagant expression of love ever created.. It's a wealth of white marble and semi-precious stone - undoubtedly the highlight of the tour. Later visit to the Agra Fort from where one can get the most moving view of the Taj from the little octagonal tower in the Agra Fort, which lies, across the river Yamuna. In the evening free for shopping. Dinner and Overnight stay at Hotel. After Breakfast proceed for Jaipur popularly known as the Pink City, built in 1727 AD by Maharaja Sawai Jai Singh II. On the way Sightseeing of Fatehpur Sikri built in red sandstone in honour of Saint Salim Chisti who foretold the birth of 3 sons to Emperor Akbar. Each important edifice here represents a type by itself, notable among them is the Diwan-e-Khas, Punch Mahal, the Tomb of Salim Chisti, and the Bulund Darwaza. On arrival jaipur check into Hotel. Dinner at the Hotel. Overnight stay at Hotel. After Breakfast Full day Sightseeing of Jaipur. Explore the City with an excursion to Amber Fort, situated just outside the city, Amber Fort is the classic Romantic Rajastani Fort Palace Afternoon sightseeing tour of famous "Pink City" which reminds of a glorious past and there is so much to see and enjoy here. Start with City Palace in the heart of Jaipur which is known for its blend of Rajasthani and Mughal architecture. Not far away is the Central Museum & Jantar Mantar which is the largest of the five observatories built by Sawai Jai Singh. The Hawa Mahal or the Palace of Winds was constructed for the royal ladies to watch the royal processions without being seen, all monuments are located in the vicinity of City Palace Complex of Jaipur. Explore the colourful Bazars of Jaipur. Overnight stay at Hotel. After Breakfast proceed for Delhi. On arrival after lunch Sightseeing of Delhi. visiting India Gate, President House, Raj Ghat and Shopping at Janpath. In the evening connect flight for onward destination.